Please see the full schedule for details. • Global Health Map-a-thon. 12-5 p.m. Rollins School of Public Health. Free with advance registration. • The Outbreak Game. 1-3 p.m. Emory Quadrangle. $10 per person; $5 for students. • Science at Emory: The Lab Changing the World. 4-6 p.m. White Hall 208. Free. • Physics Live! 9 a.m. – 1 p.m. Math and Science Center. Free. • Discovery Dialogue: Burning yak dung, a culture and science clash in Tibet. 6-8 p.m. Math and Science Center, E208. Free. • “Solve the Outbreak” workshop. 6-8 p.m. Dobbs University Center, Winship Ballroom. Free. • Science on the Screen: “Jurassic Park.” 3:30-7 p.m. Fernbank Museum of Natural History. Free with advance registration by calling 404-929-6400. • Science on the Screen: “Cancer: Emperor of All Maladies.” 7-9 p.m. Georgia Public Broadcasting, Studio C. Free with advance registration. • Exploration Expo. 11 a.m. – 4 p.m. Centennial Olympic Park. Free. Start with a beaker as big as metro Atlanta. Add scientists, artists, music, dance, robots, games, movies, lab tours and chances to try new technology and conduct fun experiments. Throw in some liquid nitrogen ice cream, giant soap bubbles and Tibetan momos. Now mix with hundreds of enthusiastic volunteers and thousands of curious people of all ages. Finally, jump in yourself. 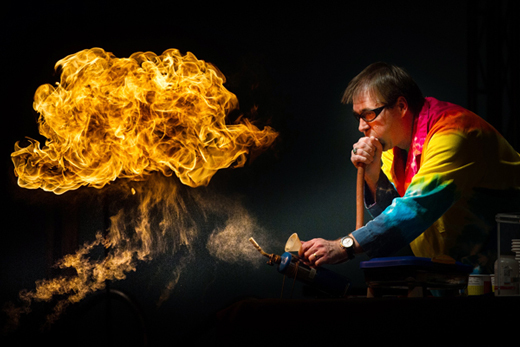 The Atlanta Science Festival is back, March 21-28, with its ever-evolving formula for fascination and fun. The eight-day celebration of local science and technology encompasses more than 120 events at 70 venues throughout Atlanta, including many on the Emory campus. The festival culminates in the Exploration Expo at Centennial Park on Saturday, March 28. Last year, 30,000 people attended the week-long inaugural Atlanta Science Festival, including 16,000 who came to the Exploration Expo, which was chaired by Emory chemist Monya Ruffin. About 20 booths at the Expo will feature Emory science faculty and students. ChEmory, for example — the outreach group made up of Emory chemistry undergraduates — will return with its popular dance pit. Kids can kick their shoes off and experience moving to music through a non-Newtonian fluid. Several events are scheduled on the Emory campus on Saturday, March 21, targeting both adults and children. For the “Global Health Map-a-thon,” led by Rollins School of Public Health, participants can learn how to use open-source software, satellite imagery and geographic information involved in the ongoing public health response to the Ebola outbreak. The project is especially seeking participants who have knowledge of West African languages and sites. “The Outbreak Game” is a chance to investigate a mock disease outbreak. Participating teams will receive face masks, lab coats and gloves, and biohazard disposal bags, then proceed to follow clues that lead them through sampling the environment, performing a lab test and interviewing mock patients to solve the mystery. “Science at Emory: The Lab Changing the World” will bring TED-style talks around the theme of light, art installations and chemistry demonstrations to White Hall. Meanwhile, “PhysicsLive” will turn the Math and Science Center into one big party, including giant soap bubbles, liquid nitrogen ice cream, physics demonstrations, lab tours and planetarium shows. Later in the week, a Tibetan tent will go up near Cox Hall bridge on Wednesday, March 25, as Emory researchers demonstrate research measuring the indoor air quality of Tibetan nomadic pastoralists who use yak dung to fuel their stoves, and how that practice may be impacting their health and well-being. The all-day tent demonstration will be followed by a “Discovery Dialogue” panel in the evening, and Tibetan momos (dumplings) will be served at the reception after the panel event. Click here for more details of Emory events. The Atlanta Science Festival was initiated last year by Emory staff, including Rose; Sarah Peterson, assistant director for student development in the Laney Graduate School; and Meisa Salaita, who has since left the University and serves as co-director of the festival. Emory is a founding sponsor of the festival, along with Georgia Tech and the Metro Atlanta Chamber. The festival now has dozens of sponsors and partners throughout metro Atlanta, and involves the work of more than 400 volunteers.